I do love a fabulous nappy bag. I especially love a fabulous nappy bag that is also stylish, practical and carries on serving my needs long after I’ve toilet trained the baby. I’m ecstatic that the nappy bag that Jessica Alba herself uses is available right now in Australia. Not Rational design and produce the most versatile line of nappy bags I’ve seen in a long time. At a large thirty-one centimetres tall, forty centimetres long and fourteen centimetres wide, this bag will take you right through from the hospital delivery room to long, long after you need to tote baby and toddler paraphernalia everywhere you go. Available in numerous colours, choose from a combination of durable canvas and butter soft Italian leather or just the divine leather alone. The Not Rational Hansel bag comes complete with a multitude of pockets inside and out so nothing has a chance to get lost, a lush leather change mat, dummy and baby bottle. 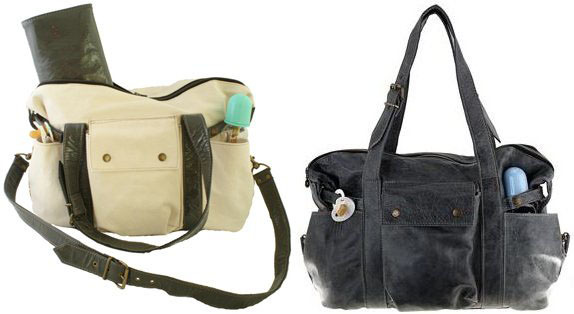 Not Rational bags are priced from $640 and available exclusively in Australia from Cedar Leaf. Delivery is available all over Australia.